Shenzhou 7, China?s third manned flight to space, has landedsafely on Earth. The spacecraft?s reentry module touched down on thegrasslands of Inner Mongolia Sunday at 5:38 a.m. ET (0938 GMT), concluding a roughly68-hour mission. The three astronauts onboard, Zhai Zhigang, Liu Boming andJing Haipeng, are reportedly in good health. Before beginning the return trip, the crew moved into theirShenzhou 7 spacecraft?s reentrymodule, and jettisoned the orbital and service modules. After the reentrymodule entered Earth's atmosphere, it released a giant parachute to soften thelanding. The weather in Mongolia was favorable, with a slightlycloudy sky and low winds. Helicopters and search and rescue teams werestationed in the area to meet the returning astronauts. Once the hatch was opened, the astronauts smiled, waved andgave thumbs up signals to the crowd on the ground. They were able to walk afterbeing helped from the capsule by rescue crews, and were each given a bouquet offlowers. The landing, egress and welcome ceremony were broadcast live on officialstate China Central Television. "It was a glorious mission, full of challenges with asuccessful end," Zhai said after landing, the Associated Press reported. "We feel proud of the motherland." The crew will be taken to a hospital in the Inner Mongoliancapital Hohhot for medical examination and is scheduled to fly back to Beijingon Monday. 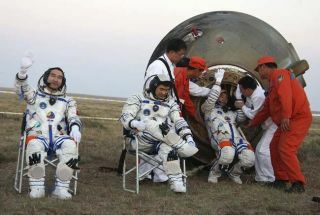 The astronauts will have to spend about two weeks in quarantinebefore meeting their families, state news agency Xinhua reported. The momentous Shenzhou 7 flight, which launchedSept. 25, included China?s firstever spacewalk, performed by Zhai Saturday and broadcast live. During the20-minute sojourn, Zhai, sporting a new Chinese-built spacesuit, collected a testsample of solid lubricant from the outside of the spacecraft that had beenplaced there before launch. Afterward, Zhai and crewmates released a small satelliteto capture images and send them back to Earth. The spacewalk was an important step in the evolution ofChina?s mannedspace program. The nation is the only country, besides the United Statesand Russia, capable of independently launching astronauts into space and, now, conductingspacewalks. Though the latter two countries achieved these feats about40 years ago, China's accomplishment is nonetheless noteworthy, experts say. ?On the one hand, yes, they are doing things that we and theSoviets did in the 1960s, so is this a huge step forward in terms of basic science?No,? said Dean Cheng, China analyst with Alexandria, Va.-based think tank CNACorp. ?On the other hand, just because your parents learned how to drive doesnot make your getting your license any less significant for you. The Chineseare only the third nation to put their own person atop their own launcher intheir own spacecraft.? The Shenzhou 7 mission follows China?s second manned flight,the five-day, two-manned Shenzhou6, in October 2005. The country?s first mission, Shenzhou 5, launchedastronaut Yang Liwei into Earth orbit in October 2003. Some predict Chinese missions may start to ramp up infrequency, if the nation hopes to eventually rendezvous and dock two spacecraftin orbit, and build a space laboratory. ?The launches should be starting to be closer together,?said Joan Johnson-Freese, an expert on the Chinese space program at the U.S.Naval War College in Rhode Island. ?If they want to do the docking they?re goingto have to do two missions close together.? Though the Chinese don?t seem to be in too much of a rush,some experts say they have initiated a space race with the United States, withthe ultimate goal again being to land on the moon. ?I do think it sets up the perception of a space race, butthis race, if there is one, is of political will,? Johnson-Freese told SPACE.com. ?This is the classic tortoise and the hare situation. We just don?t seem tohave the political will to be doing what they?re doing. ?